The Olympics have been fascinating the world for the last 2 weeks. The first Olympics were held in 776 BCE at the first full moon after the summer solstice. There was only one event - a running race over one length of the stadium track. The distance was called a stadion. In later games longer distances were run, up to 20 stadions. A stadion is equivalent to 183 m (some sources say 192 m). A metre today is defined as the "length of the path travelled by light in vacuum during a time interval of 1/299 792 458 of a second". A definition which would be incomprehensible to the ancient Greeks running the stadion. The marathon was not an event at any of the original Olympic Games. The race commemorates Pheidippides, who ran 149 miles from Marathon (just outside Athens) to Sparta with news of the Persian invasion in order to enlist aid for the battle. The current marathon length is taken from the 1908 London Games. It is, improbably, the distance between Windsor Castle and the old White City stadium, with 385 yards added on so the race could finish in front of King Edward VII's royal box. 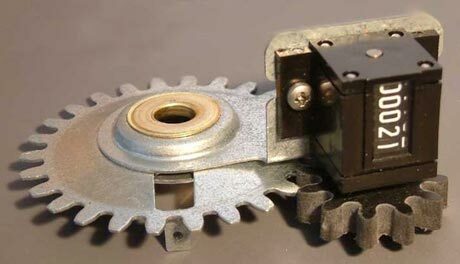 The marathon is measured out using a "Jones Counter" which counts the revolutions of a bicycle wheel. "Olympic-sized swimming pool" is sometimes used as a unit of measurement to describe volume - Melbourne Cricket Ground is equal to 630 Olympic swimming pools. NIST (US National Institute of Standards and Technology) has an official definition as 1 million litres, less than the 50 m x 25 m x 2 m standard Olympic pools volume of 2.5 million litres. Recently there have been several ties in the swimming races. Michael Phelps, Laszlo Cseh and Chad le Clos all gained a silver medal this year in the mens' 100 m butterfly. 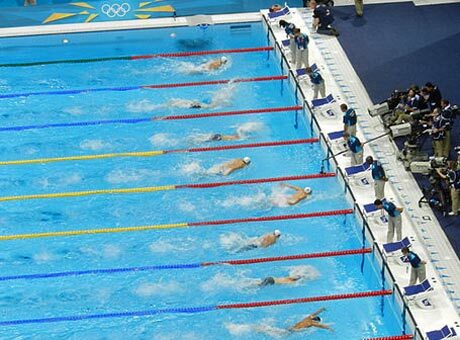 Although they could be separated by milliseconds, that's less than the tolerances of the pool construction. The swimming lanes can be up to 3 cm different in length. The Olympic record for the 100 m butterfly is held by Joseph Schooling of Singapore, with a time of 50.39 seconds. That works out at 15 milliseconds to cover the 3 cm. Which is why even though the timing technology can separate the swimmers, the tie is instead awarded.